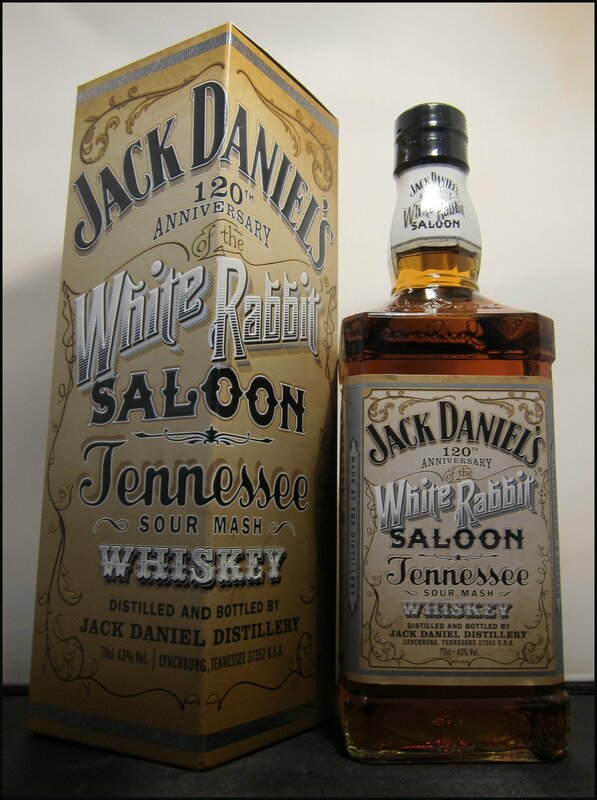 2012 sees the 120th anniversary of The White Rabbit Saloon, the saloon that Mr. Jack Daniels owned and operated in Lynchburg, Tennessee. 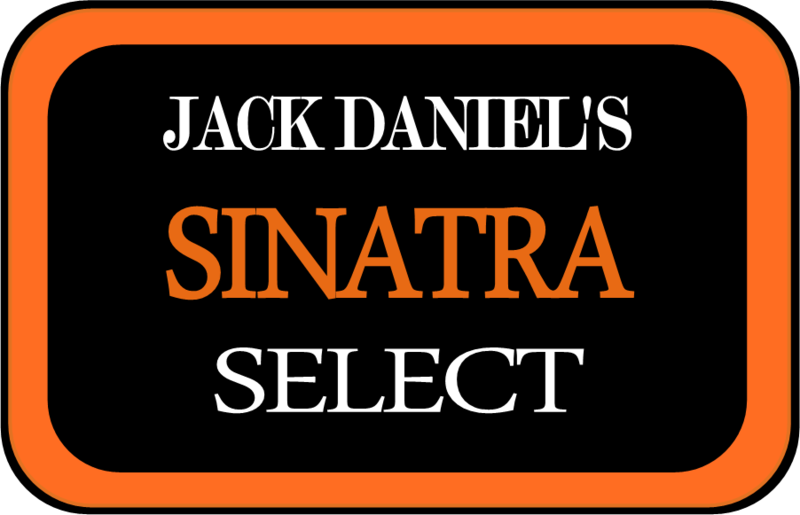 To celebrate this, the Jack Daniels Distillery have released a special version of their Old No.7 variety (for details on other variations of Jack Daniels, check out our comprehensive tasting here) named after this famed watering hole. The main difference in this version is that it is bottled at 43%ABV, rather than the 40%ABV that’s common for the Black Label No.7 whiskey in the UK and US today. Funnily enough, going back thirty years, Jack Daniels No.7 was bottled at 45%ABV, which was then reduced to 43%ABV in the late 1980s and reduced further to its current 40%ABV in 2002. The whiskey comes in a presentation box with very decorative labelling and verbiage relating to the experiences of customers in Mr. Daniels’ own saloon. The bottle is in keeping with the new, clean-line style of Jack Daniels in the UK and, frankly, I’ve not yet come round to it as for me it has less character. But let’s get on to the more substantial and important matter of taste. Colour: Amber, with a tinge of red. Nose: Warm, soft and slightly sweet caramel and vanilla. Faint hints of banana toffee that lead to nail polish if your nose lingers too long. Taste: Smooth to start, being sweet and woody, but this flavour is quickly overtaken by an artificial tasting, bitter, creamy note that lasts. The finish is then quite clean, dry and woody, with a pleasant, light note of banana toffee. It’s slightly warming, but not forceful. Overall, I couldn’t help but be disappointed with this whiskey; the beginning and finish were both so good, but that bitter note in between was just horrid. Interestingly, where I tasted bitterness, DTS didn’t taste much at all, finding it bland. This has a lovely nose of smoky, charred banana toffee. The banana and toffee notes follow through on the taste, along with vanilla, but – oddly – this Old Fashioned isn’t at all sweet and there’s a notable lack of flavour at the front of the tongue. There are hints of bitterness before a finish of light wood. Although the nose and finish were good, the flavour of this cocktail left something to be desired. As an interesting experiment, half of the Old Fashioned was decanted and placed in the freezer. This improved it greatly, adding a light, cherry note to the nose and stronger notes of wood and a hint of coffee to the taste. A promising start of wood and caramel is quickly overtaken by that same, persistent bitter, dry note, which is distracting and artificial. The finish was odd, being slightly creamy, before becoming short and dry. Definitely not the best way to enjoy this whiskey. A light, traditional bourbon nose of wood and vanilla, tinged with a refreshing sweetness. Initially dry, this drink then fades into that bitter flavour. The finish is clean and short, with hints of sweet ginger. Although I still didn’t like the bitter aspects, this was my favourite of the drinks that I tried. I really wanted to like this whiskey. I adore the label and story behind the White Rabbit Saloon and think that the concept of “sippin’ whiskies” that people can enjoy with friends on its own, straight from the bottle, is a great one. Unfortunately, I just didn’t like the bitter taste of this one, either on its own or in cocktails; my favourite way of drinking it was with ginger ale or in the intriguing frozen Old Fashioned. We do, however, have some bigger fans of Jack Daniels in our family and I look forward to seeing what they think of this; when I do, I’ll update this post. 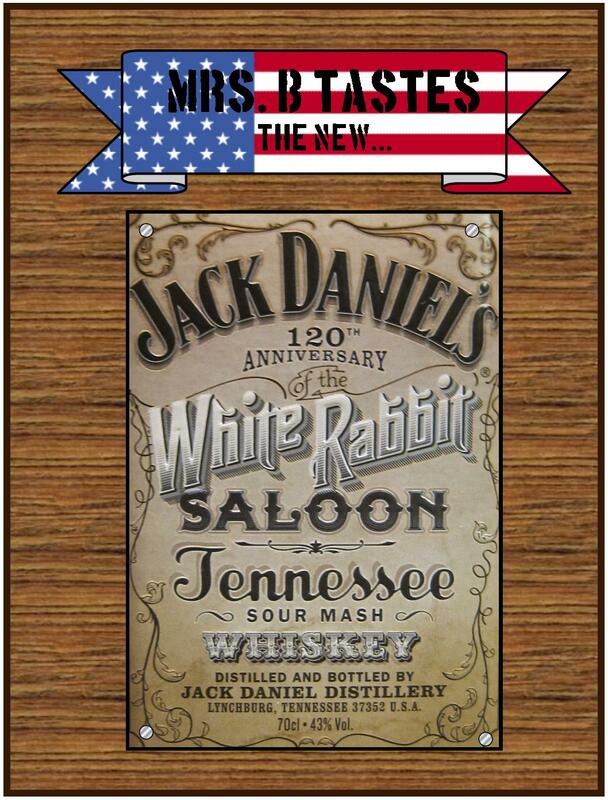 Jack Daniel’s White Rabbit Saloon 120th Anniversary is available for around £26 for 70cl from The Whisky Exchange. Whilst wandering the aisles of our local Waitrose on Monday, DTS & I scanned the whisky section for new and interesting additions. There weren’t too many new faces, but one of the exceptions – and rather appropriately timed, given last week’s post – was The Famous Jubilee. 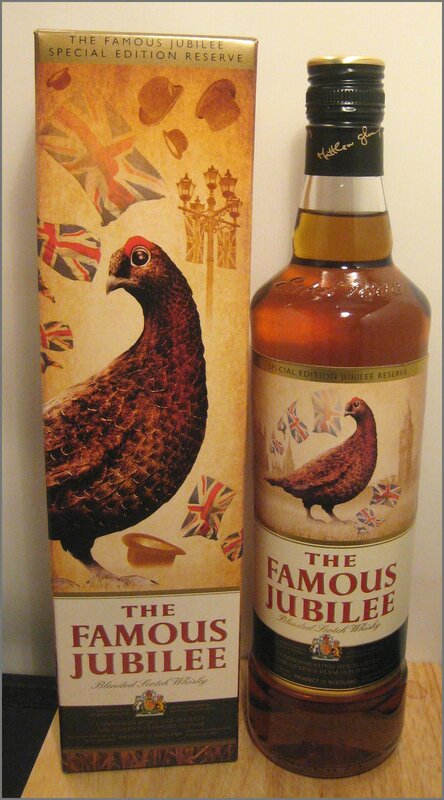 It was sitting in its Jubilee celebration themed box, but was both next and nearly identically priced to The Famous Grouse, so both of us initially assumed that it was simply a special packaging. Fortunately for me, DTS is naturally curious about such things and took a closer look, after which we realised that it was actually a special blend. Matthew Gloag & Son, the company behind the Grouse brand, have the Royal Warrant to HM the Queen for blended Scotch, so it’s understandable that they have created a blend especially to celebrate Her Majesty’s Diamond Jubilee this month. 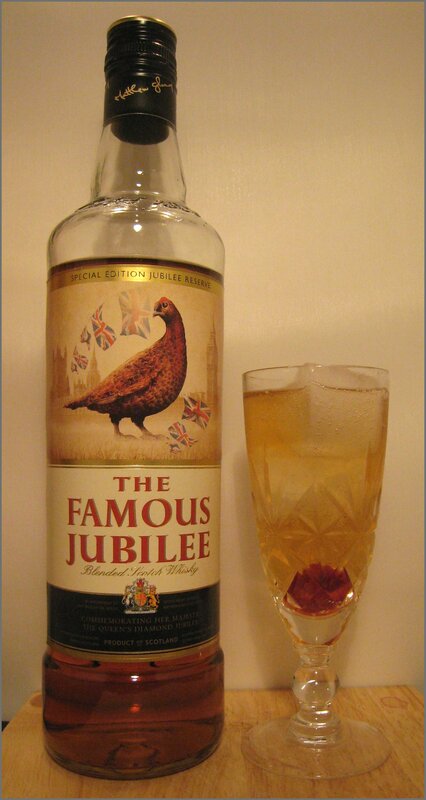 The Famous Jubilee is a blend of malt and grain whiskies, including some from Highland Park and Macallan. It’s available exclusively via Waitrose and, should you want to get yourself a bottle, be aware that Sainsbury’s are selling The Famous Grouse in a special Jubilee box that looks very much like the one for The Famous Jubilee, but without the new blend inside; make sure you’re buying the one you’re after! Without further ado, here are my notes on this new, celebratory whisky and a few cocktails that DTS & I thought would be particularly fitting. Nose: A distinctive, golden syrupy sweetness introduces you to this lovely nose. Before it gets too sickly, this fades into oats, then drier grain, before finishing with an incredibly light smokiness. Compared to the nose of The Famous Grouse, this is a lot sweeter, more mellow, and less nutty, making it both more accessible and warmer than the standard blend. Taste: Good, strong, savoury flavours: hints of malt dominate on the tongue, whilst drier grain notes were more evident at the back of the mouth. A savoury whisky, indeed; somewhat reminiscent of The Naked Grouse, but richer and warmer. Nose: It’s amazing how much of a difference a drop of water can make! The nose is now much busier, with warm spices making that initial sweetness more interesting. Taste: Much sweeter, but still with a dry, savoury finish, this was generally less harsh, with a slowly building, comforting warmth. Occasionally I got odd hints of dry cocoa and charred wood on the finish. 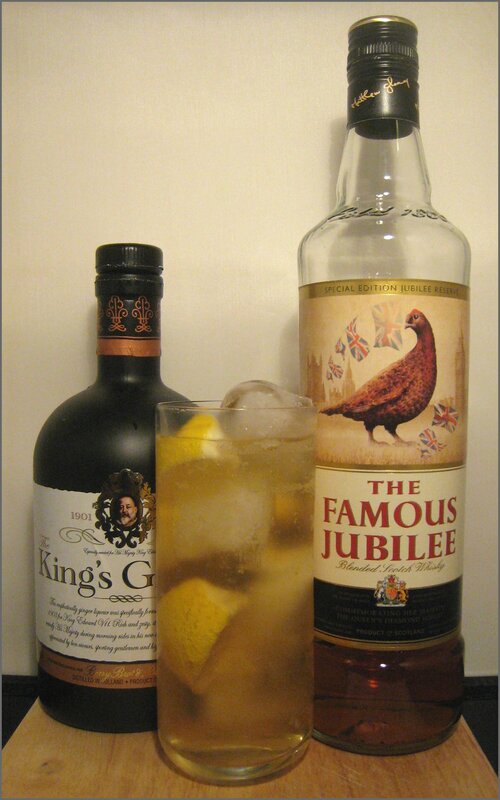 Add a serving of Famous Jubilee and a good dash of apple juice to a glass of ice, then top up with ginger ale. Garnish with a slice of green apple or a fresh raspberry. Although there’s not much going on the nose of this drink, it’s absolutely delicious to sip: the splash of apple juice instantly sweetens and lifts the savoury whisky and dry ginger ale, but without covering up the malt and grain of the whisky. Perfect to serve at a Jubilee celebration. Take equal parts of the whisky and red vermouth (using any appropriately-sized measure) and shake or stir briskly with ice. Fine strain into your glass. The red vermouth dominated the nose, with lots of rich, spicy notes. This came through strongly on the taste, too, producing a rich, flavourful drink with lots to spice to start, followed by a more bitter finish. This won’t be for everyone, but, if you like rich, bitter drinks, it could be the one for you. The nose is distinctly of sherbet lemons, but any fears that this drink would be overly sweet were quicky debunked; this drink is refreshing and savoury, taking the dryer elements of the whisky and the ginger, freshening everything up with some bitter lemon notes, and throwing the very faintest hint of sweetness right before the finish kicks in. The whisky also adds a comforting, but not excessive, warmth to the end of this cocktail. A lovely, refreshing long drink for those less fond of sweet cocktails, and/or who like the grain notes in the whisky. I was impressed by The Famous Jubilee, which I found to be both accessible for those who don’t normally drink Scotch and interesting for those who do. Smooth and spicy malt to taste, with a sweet nose and a dry, grain finish, I thought that it was at its best on its own in a glass (maybe with a drop or two of water) and left to warm up for a few minutes, but it also worked well in an array of cocktails; my favourite of these was the bubbly Whisky Royale. 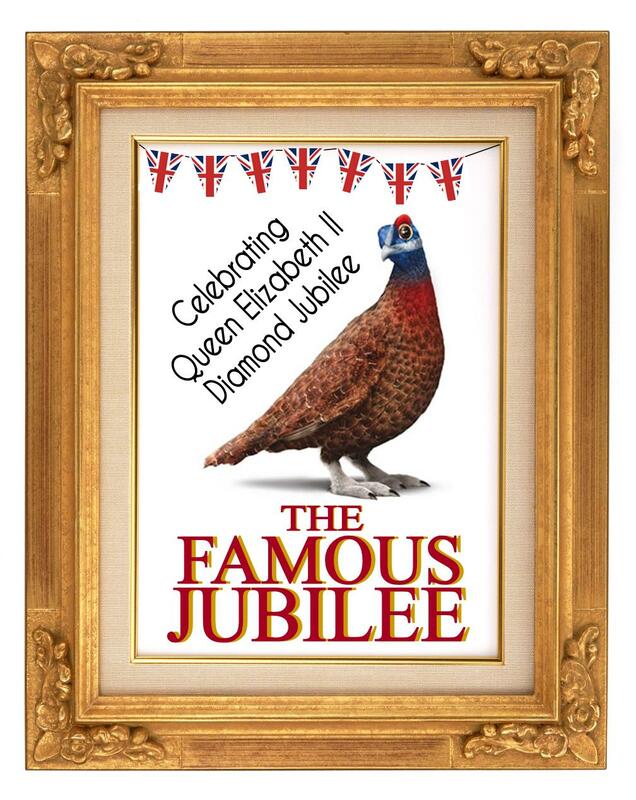 Although Famous Jubilee, exclusively available from Waitrose, has a reasonable RRP at £24.99, we found The Jubilee Grouse currently on offer for £20.99.